FILE PHOTO - Philippine's President Rodrigo Duterte delivers his opening speech during the ASEAN-US 40th Anniversary Commemorative Summit in Manila, Philippines, November 13, 2017. 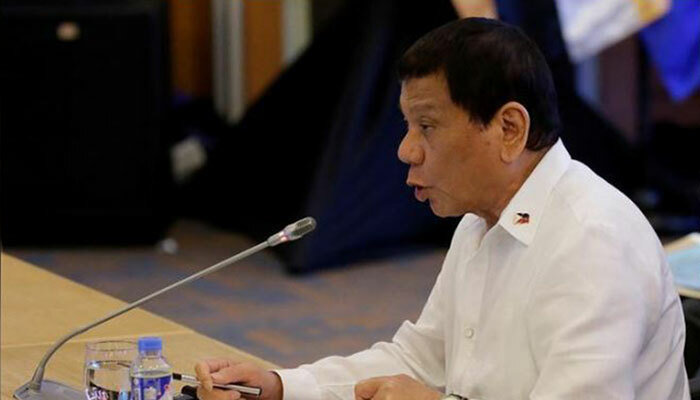 MANILA: Philippine President Rodrigo Duterte said on Friday he has ordered the military to cancel a $233 million agreement to purchase 16 helicopters from Canada, whose government expressed concerns they could be used to fight rebels. The Philippines and Canada formally signed the helicopter deal on Tuesday. The following day, the Canadian government ordered a review, in response to comments to Reuters by Philippine Major-General Restituto Padilla that the helicopters would be used for operations against communist and rebels. The Philippine defense minister later clarified that the Bell 412EPI helicopters were mainly for transport, rescue and disaster response. “The reason I‘m buying helicopters is because I want to finish them off,” he said. The Philippines hit a hurdle in trying to procure for the police some 26,000 M4 assault rifles from the United States. Duterte eventually canceled the plan after several senators threatened to block the sale over human rights concerns.